Sleeps up to 4 people (2 +2). Located on the third floor with a terrace overlooking the sea. Sleeps up to 4 people (2 +2). Located on the ground floor, has a terrace with partial sea view. Sleeps up to 3 people (2 +1). Located on the second floor with a terrace overlooking the sea. Sleeps 2 people. Located on the second floor, has a shared terrace (no sea view). Sleeps 2 people. Located on the ground floor, has a shared terrace (no sea view). From Split to Vis there are two operating ferry lines on a daily basis, and in the season three ferry lines. Enjoy traditional dishes on the terrace of our family tavern „Jasmina“, watching the sunset and listening to the waves. 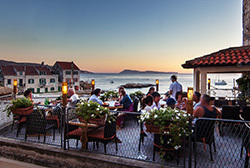 The tavern is located just a few meters from the sea, in the Lucica bay port, and has a 40-year-old family tradition. The most remote of all Croatian islands, covering an area of some 90.3 km2, is 45 miles from the coast (from Split), and some 60 miles from the Italian coast. Around the island of Vis there are numerous other smaller islands and islets. Every year on the Town of Komiža Day (December 6th) traditionally an old wooden boat is burned as a ritual sacrifice for the salvation of sailors, fishermen and passengers, whose patron saint is St. Nikolas. If you want to spend your holiday in peace and quiet, surrounded by the scents of lemons, oranges, and the grilled fish that will make you dizzy in stupor while strolling around the old town, you’ve come to the right place. The experiences of our guests tells us stories about our newly renovated rooms that give a pleasant, positive energy and call for the rest and relaxation. The natural beauty of the island can best be introduced from the sea. We start from Komiža south side to the bay Stiniva which is the most attractive because of its unusual natural look. Blue Cave, is located in a small bay of Balun on Biševo. The cave has two openings, one smaller one artificially deepened, through which it can take a boat. The second opening is like the arch on the south side of the the cave, below sea level. biševo is an island located about five nautical miles southwest of Komiže. to him several settlements, among which is the most famous bay port with a beautiful sandy beach. Our team is ready to answer all your questions, and always stands at your disposal for any kind of help. The tavern is located just a few meters from the sea, in the Lucica bay port, and has a 40-year-old family tradition, where three generations of one family work side by side. The form of the tavern will remind you of a ship anchored right in this very quiet cove with a beautiful beach. A fish stew made of conger eel, a scampi/prawn buzara, a black (cuttlefish) risotto, grilled meat dishes, flan/custard pudding, a carob cake, and many other dishes prepared according to old, traditional recipes. All our dishes we be served on the terrace with an unforgettable view of the beach, and the islands of Biševo and St. Andrew. Come and enjoy the local delicacies on our terrace, and while waiting for dinner relax by watching an unforgettable sunset with a glass of Komižan Plavac. If you are at the town’s waterfront, come to the clocktower, so called the Commune, and the Church of Our Lady Of The Seven Sorrows, and take the narrow cobbled street that will take you straight to our family tavern.